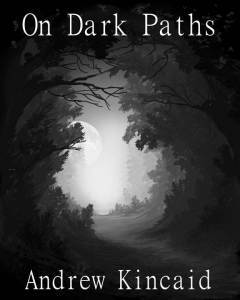 On Dark Paths is a collection of thirteen short stories, by Andrew Kincaid, that will send chills up your spine. - A mysterious stranger and horrible sounds from the night give the briefest glimpse into the horrors "Beyond the Veil"
- Is it merely a dream? Or is it a horrific glimpse into Outer Darkness? "Plop!" - A mysterious video wends its way through the digital world, leaving nothing but madness and destruction in its wake in "...And the Truth Shall Make You Free "
"Where the Darkest of Dark Things Dwell" - Sometimes it isn't the monster outside that gets you. Sometimes it's the one inside. - A modern day Frankenstein learns the price of hubris in "Murphy's Law"
- Nothing can save you now. You've been bitten... in "The Bite"
-A sleepy little mining town conceals a horrible truth beneath its feet in "Benton's Station"
-The nighttime fancies of childhood sometimes turn out to be all too real in "It Came At Midnight"
- A paranormal enthusiast gets much more than he bargained for in "Death At a Train Crossing"
- It lurks in the woods. Watching. Waiting. What is it? No one knows. "The Thing That Smiles"
- An eccentric author receives a pair of strange visitors one rainy night in "Black Eyed Kids"
- A mysterious box reveals Everything...but for a price... in "The Spirit Box"
- A journalist learns the truth about a devastating plague that has swept the world in "Pandemic Hysteria"
There you have it. Thirteen stories to chill the blood. Thirteen stories that lay bear the strange reaches of our world and the dark ways beyond it. Won't you walk with me On Dark Paths? I took Andrew up on his offer and started On Dark Paths in a darkened room and quickly regretted it, especially when something literally scratched the wall outside my house. Luckily, it wasn't the same dark creepy thing from Andrew's first story, "Beyond the Veil." It did however send me off into an uneasy sleep. I left the rest of the thirteen stories for daylight hours. Who's a big scaredy cat? Not me! Well, okay, maybe just a little, but I blame Andrew for his incredible writing skills. After all, those were his words that pulled me in and made me believe for a minute that something was out to get me. *Looks around worriedly* maybe it still is... night is closing in and I ... well damn, I'm terrified! There, I said it! Don't judge - till you read On Dark Paths for yourself. In all seriousness, I really enjoyed the short stories in this book. They were a welcome change from the books I have been reading, with the light and fluffy almost bad guys. These short stories took me away for a quick trip into another reality and deposited me back, firmly in my favorite reading spot shivering and shaking, wondering what that noise was. Should you pick the book up know that as you sit wondering if you should get up and check on the noise or run and hide, you can thank Andrew Kincaid for scaring you stupid! This is a fantastic collection of short horror stories that will delight, scare, and enthrall you until you finish the final thirteenth tale. Of course there would be 13! Go pick the book up. The great thing about short stories is that you can read one and recover before continuing to scare yourself senseless. *This review was featured in The ShriekFreak.com Daily.